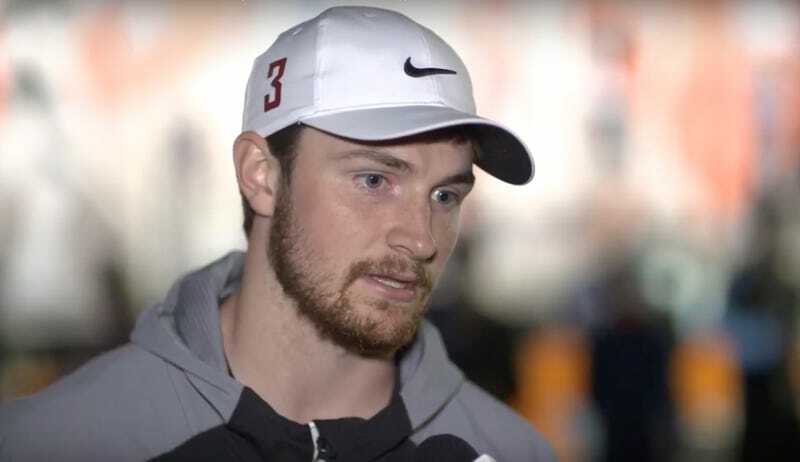 Washington State QB Luke Falk arrived in Alabama for the Senior Bowl wearing a No. 3 jersey to honor his teammate Tyler Hilinski, who died by suicide earlier this month. Falk and Hilinski played for the Cougars together for a few years, and as Falk heads towards the NFL Draft, he said he wanted to honor Hilinski’s memory and make sure people remember the sort of person he was. Washington State held a candlelight vigil for Hilinski last week, and while Falk said it helped the team find closure, he also said that the pain of Hilinski’s death will stay with him. We really want Tyler to be remembered and this to be talked about. I mean, when suicide is the leading cause of death of men from 18 to 45 years old, it should be talked about. And we should do something about it. I feel like at times we feel like we can’t express our emotions because we’re in a masculine sport. And him being a quarterback, people look up to you as a leader, so he felt like he really probably couldn’t talk to anybody. You know, we gotta change some of that stuff. We gotta have resources and not have any more stigma on people going through that. I just felt like [the jersey switch] is what I needed to do. He needs to be remembered. He was an amazing person and an amazing soul. This guy was one of the most outgoing, bubbly ... just a guy you want to be around. And people need to know it.